Our cake was for an anniversary celebration and it was wonderful! 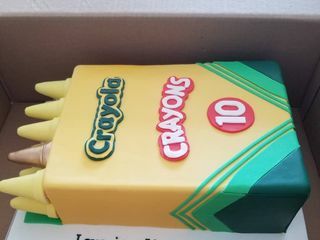 My boyfriend and I have an inside joke about a crayola box where there's all yellow crayons except one gold one. This cake was so well done it and it looked better than I imagined! Jess double-checked the number of crayons and essentially created a sculpture. Of course, the inside was delicious too! I couldn't believe how beautiful it looked. Jess was great. 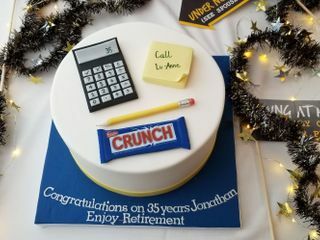 She made a special cake for my dads retirement party and it came out amazing. People were impressed with how it looked and even more impressed at how good it tasted. She was super responsive and easy to work with. I highly recommend her. Jess made a great tasting over the top cake for my sons first birthday party. She is extremely talented. I would definitely use her again!! Jess was great! The cakes came out amazing and tasted great! Fantastic from beginning to end! Jess was fabulous to work with. I sent her a pic of my vision for the cake, we spoke and worked out the details. The cake looked amazing and tasted delish! I can’t say enough about how fantastic the cake was. From the taste to the intricate detail, just fabulous. My husband was in awe at the detail and how personalized it was to him. Thank you so much for being a part of our celebration and making it as memorable as you did. This was a surprise Birthday not a wedding but none the less spectacular of a cake! Jess was amazing to work with!!! She was very quick to respond and easy to get in touch with! The cake was absolutely delicious and exactly what I wanted. It was absolutely beautiful and an exact replica of the picture I sent!! While the cake was beautiful and my daughter aboslutely loved it, the guests were literally scraping their plates to grab every morsel of crumbs. Jess makes extraordinary cakes- I'm so glad I found her! She has made cakes for all of my son's birthdays (he just turned 4), and they've all been really special & extremely delicious. She's great at transforming ideas into works of art. Obviously I highly recommend her! The bride and the guests loved the “friends” themed bridal shower cake. It was beautiful and the cakes (both cannoli and red velvet) were delicious!! Amazing desserts! Equally beautiful and delicious! Will definitely order again and again. The hit of the bridal shower!! Perfection! So happy with our dessert table. Just wish we ordered more. Not one cookie, cake pop or cupcake left! Jess not only made an absolutely stunning and beautiful wedding cake for my wedding but after doing our taste testing for the big day, we ended up ordering Kate Spade inspired cupcakes from her as well - which were yummy and gorgeous. Jess was so easy to work with and we highly recommend using! My experience with Jess was wonderful. Everything I wanted and asked for she was able to do for me. She made everything so simple and amazing. Highly recommend! Wedding Cupcakes & Cake! We wanted something a little less traditional for our wedding desserts but didn't have a solid idea and Jess helped us figure out the perfect option. We did a cupcake tower with a small 8 inch round cake on top for cutting. 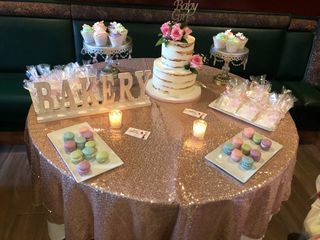 It not only looked amazing on display but the cupcakes we a HUGE hit with our guests and everyone raved how delicious they were. Jess was very responsive and helpful with all of my many questions I had for her! After reading her many wonderful reviews I contacted Jess to make a cake for my son & future daughter-in-law's engagement party. She surpassed my wildest expectations! She responded quickly and was very kind in guiding me with her expertise when I had questions. She even had a "plan B" icing for our cake if the weather was to hot & humid. She delivered the cake to the venue where she decorated it with fresh flowers. We were thrilled with the results! The cake was as beautiful as it was delicious. We couldn't decide whether the cannoli layer or the chocolate mousse layer was yummier ! (I confess to having one of each--it was worth every calorie!) My experience with Jess was a complete pleasure from start to finish. I highly recommend Just Desserts by Jess for the perfect finishing touch to your celebration. Thanks so much Marie! It was a pleasure working with you! The cake Jess made for our wedding was absolutely beautiful. It was perfectly assembled and super simple, just like we wanted it. The fresh raspberries were a big hit with our guests! Jess made an awesome unicorn cake for my daughters birthday- we worked together on what it would look like as it wasn’t the standard unicorn horn cake and it came out exactly how I had imagined. She also did cookies for us that were adorable. I recommend her to all my friends! 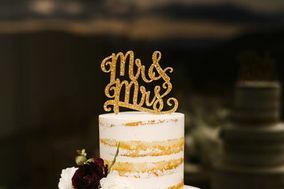 I've been using Just Desserts by Jess for years for several occasions including my engagement party, bridal shower, rehearsal dinner and birthdays, so when I was planning my wedding, I knew Jess would make my wedding cake. 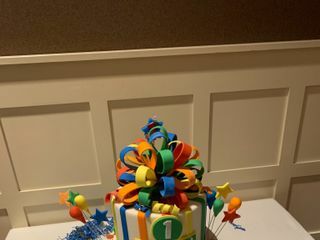 My husband and I, along with all of our friends and family, were blown away by not only the design of the cake, but the quality and flavors of the cake. They are still talking about it! Jess is always extremely professional, reliable and very easy to work with. She listens to your ideas and helps by suggesting ways to make your vision a reality. 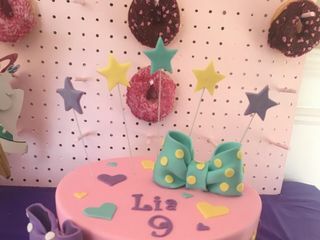 Her attention to detail and love for what she does really shows in each cake she makes. I would highly recommend Just Desserts by Jess for your wedding, or any occasion and I will definitely be going to her for all our events in the future. Jess was professional, reliable, responsive and accurate with all her details. Despite many email exchanges she followed through with every request I had. 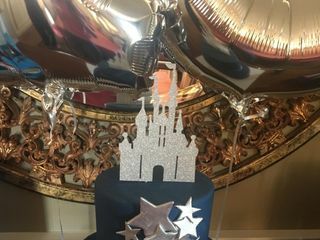 The design of the cake was perfection! It looked exactly as the picture I sent her and it tasted great too! I would highly recommend her services. I am so happy to have found Just Desserts by Jess. 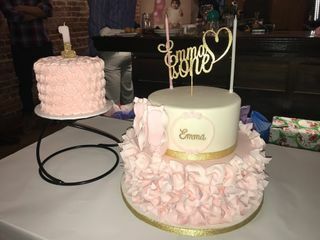 I had a vision for how I wanted the baby shower cake to look and Jess brought it to life with every single detail and more. She is a true artist. Her cakes are a work of art so much so that you won’t even want to cut into it because it’s so stunning. When we did cut into it it tasted delicious too!! I also loved the cake pops they were the best I’ve ever had. I will absolutely work with her again. What a pleasure to work with and a brilliant and talented artist. Thank you for everything. Guests are still talking about the cake!! Jess created a cake straight out of imagination. She listened to my ideas as we moved through the process and provided generously sized, delicious tasting samples to help us determine the best choice. The final cake was delivered on time to our venue and was an elegant backdrop at the reception. It not only looked wonderful, it tasted great as well, something not often found in a wedding cake. I would recommend Just Desserts without reservation or hesitation. Jess made my daughters sweet 16 cake. It was amazing. We could not ask for anything better. Jess was very profession and delivered the cake to the catering hall. My daughter was so happy with the cake. Not only was it georgous it tasted great! !